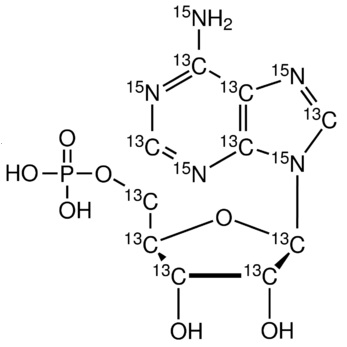 Madara, J.L., Patapoff, T.W., Gillece-Castro, B., Parkos, C.A., Delp, C., Mrsny, R.J., 5'-adenosine monophosphate is the neutrophil-derived paracrine factor that elicits chloride secretion from T84 intestinal epithelial cell monolayers. J Clin Invest, 1993 May, 91(5):2320-2325. Description: A labeled nucleotide used as a monomer in RNA.